Tap on the Pre dip field. 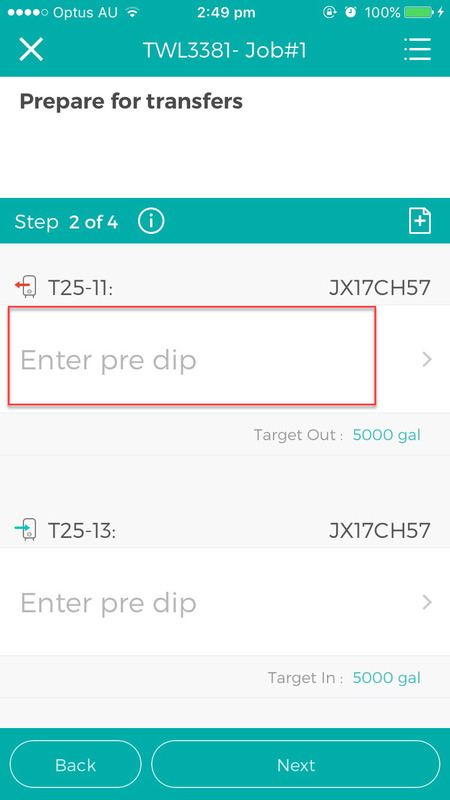 Enter the pre dip value and then click on OK. 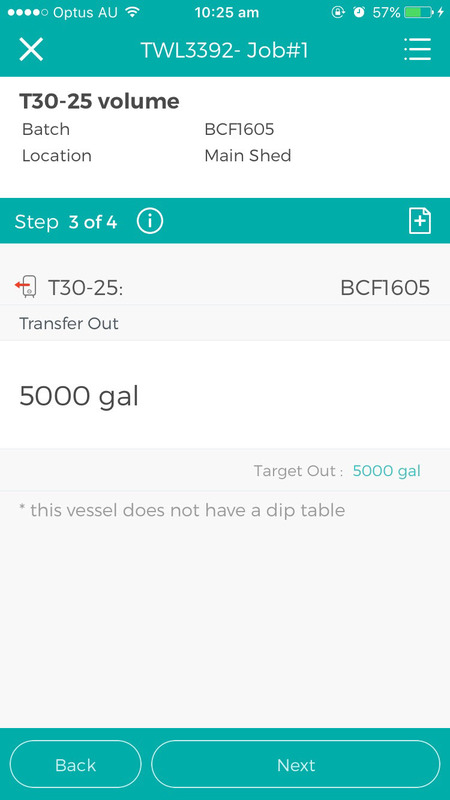 This will calculate the Target Dip for the vessel. 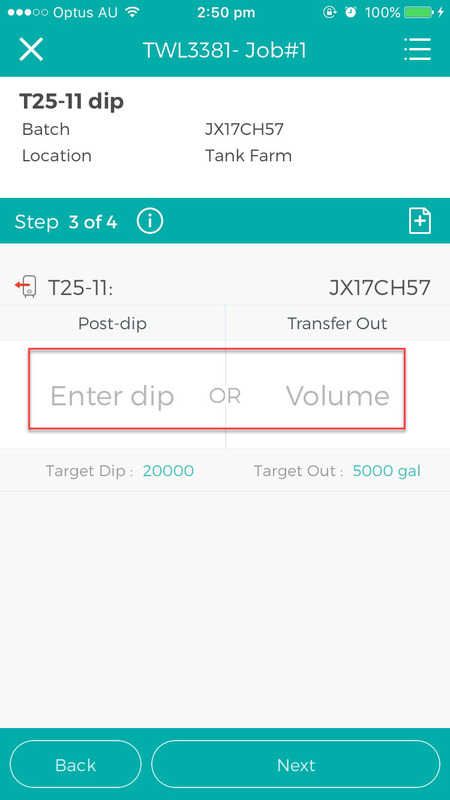 To enter the Post dip or volume, tap on either Post-dip or Transfer Out field. 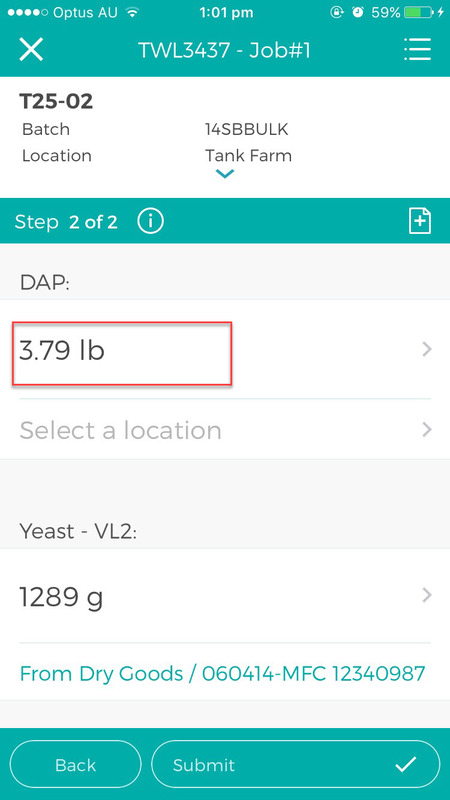 When you enter the dip, it will auto calculate the equivalent volume and vice versa. 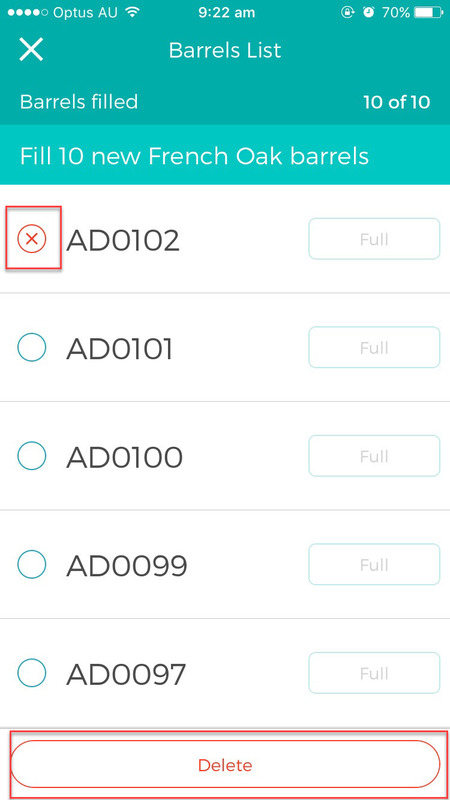 Tap on Submit once you have entered all the data required for the work order. 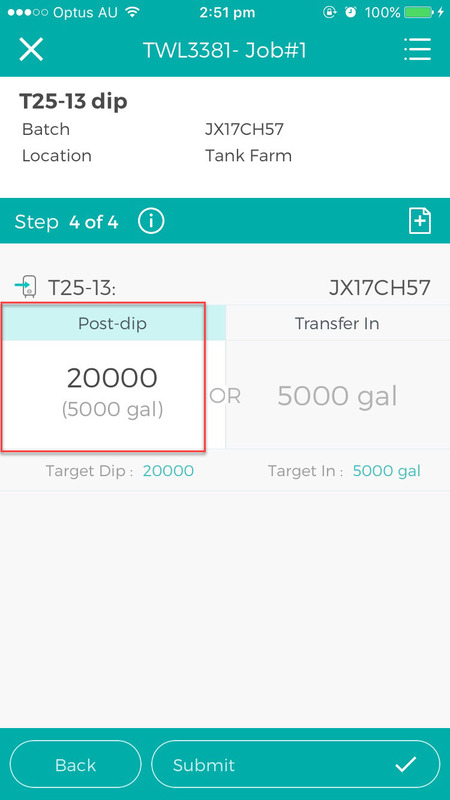 Tap on Transfer Out field. 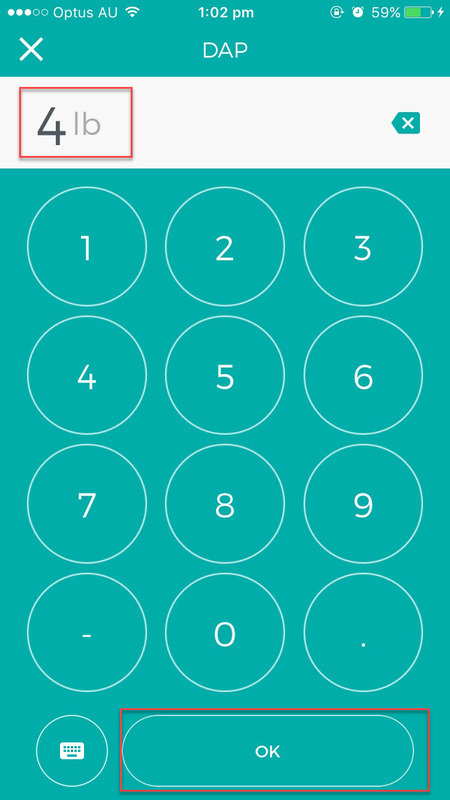 Enter the volume and tap on OK. Tap on the list icon in the Empty barrels step. The barrels that were selected to be emptied by the winemaker upon scheduling will be listed under Empty specific barrels list. 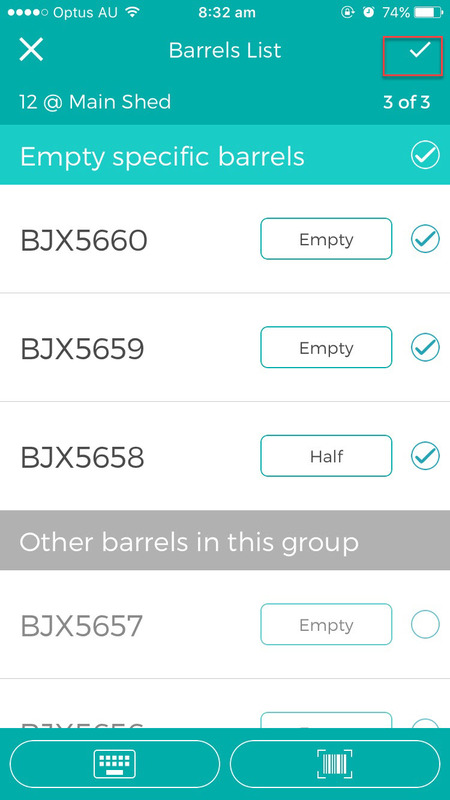 You have the option to select these barrels and the other barrels in the group by scanning the barrels that were emptied by tapping on the barcode icon. 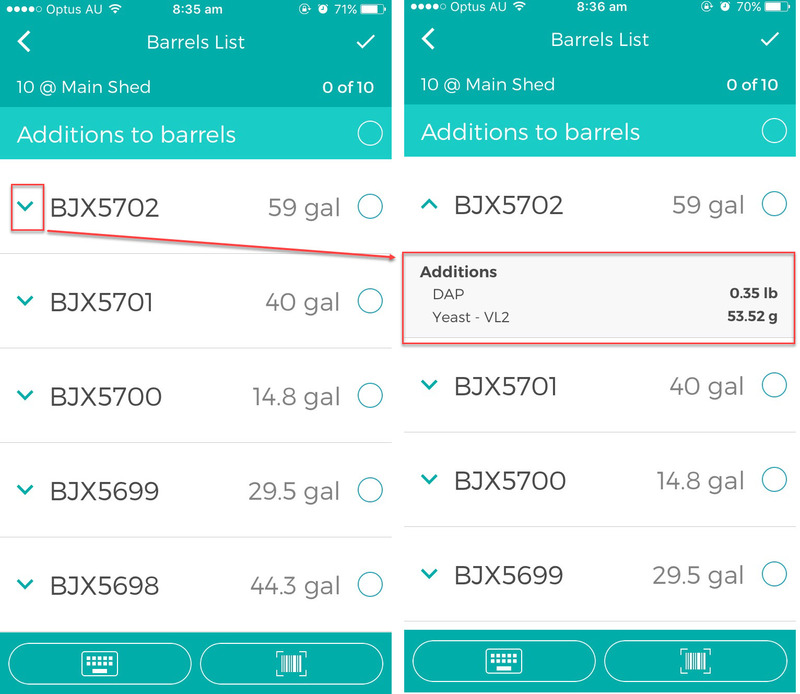 Once you have scanned the barrels, these will be checked in the list. 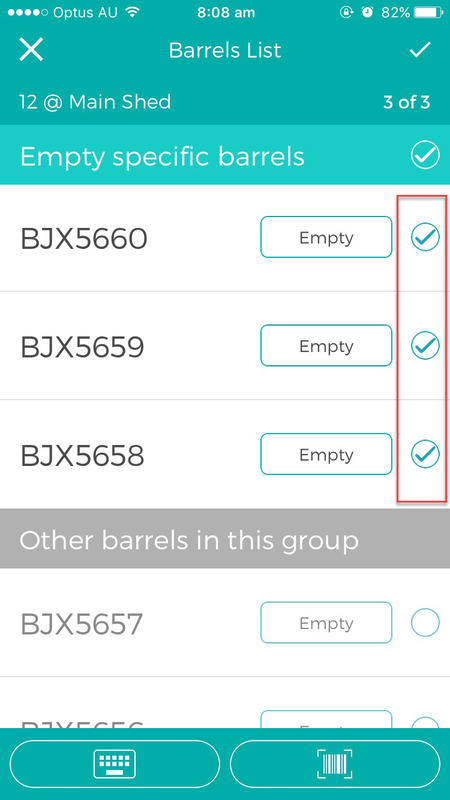 Alternatively, you can manually select the barrels by tapping on the checkbox beside the name. 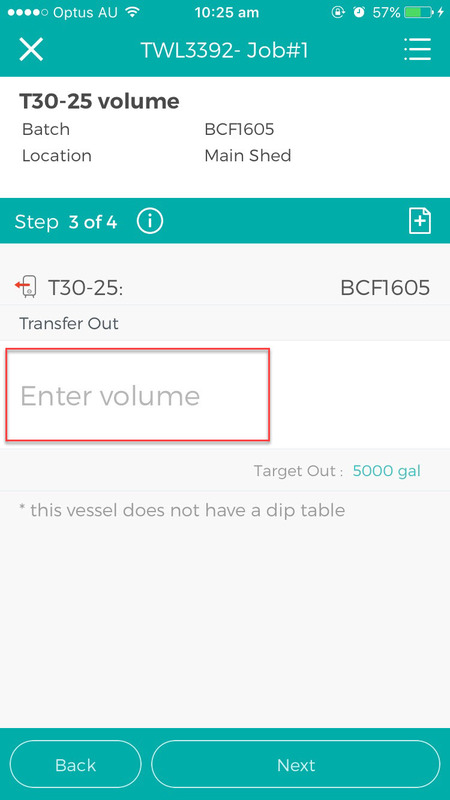 You can set the barrel’s volume to other than empty by tapping on the volume indicator. 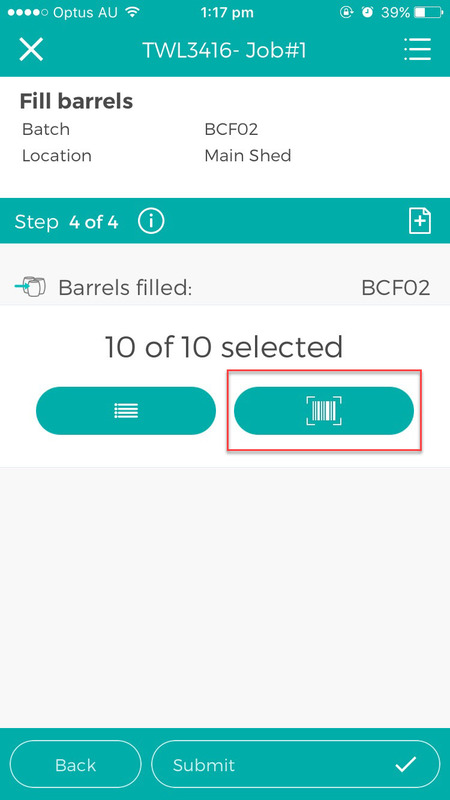 Once you’re finished selecting barrels and setting the volumes, tap on the check icon on the upper right to complete the barrel selection step. 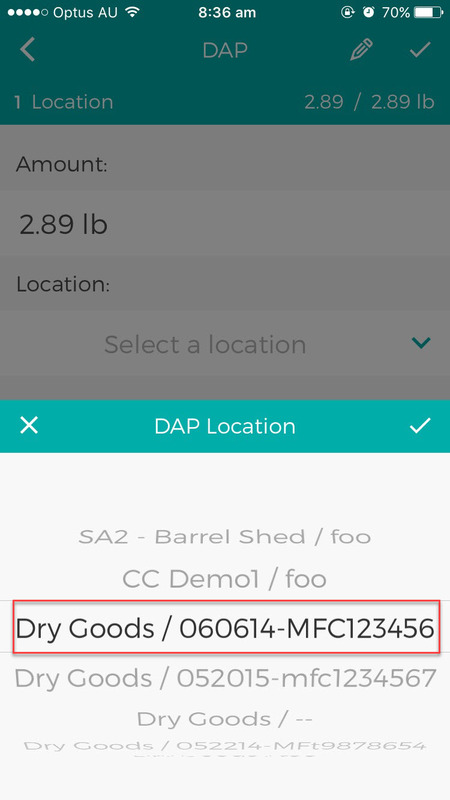 The example below shows a transfer to barrel group operation where the winemaker has instructed cellar hand to fill new barrels. 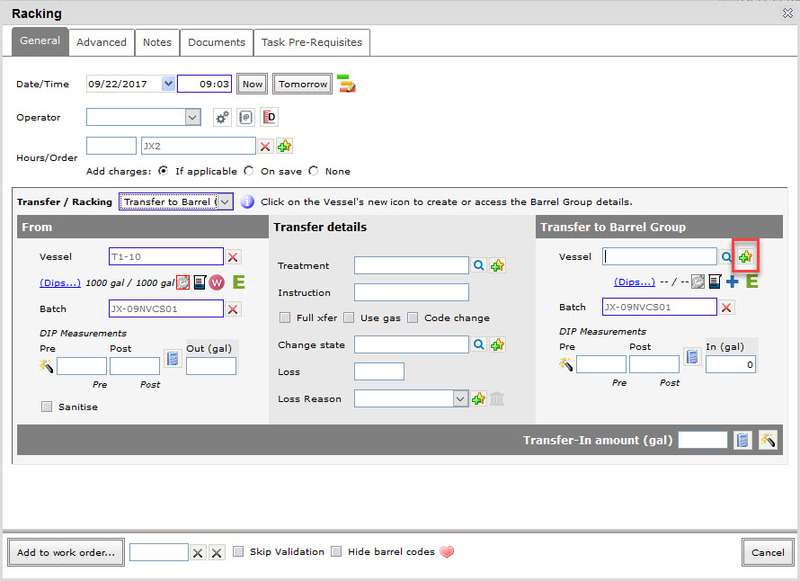 Click on create new barrel group icon on the destination vessel in vintrace web application. Click on Provide fill instructions. 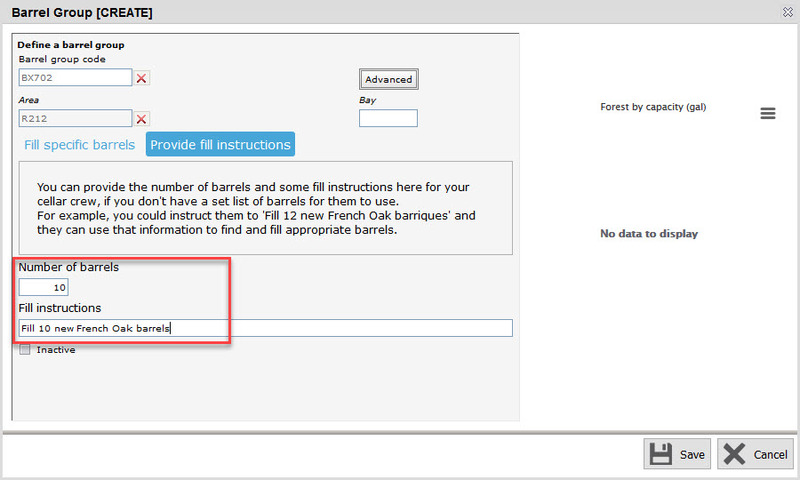 Enter Number of barrels and Fill instructions. Save the barrel group and save the work order. 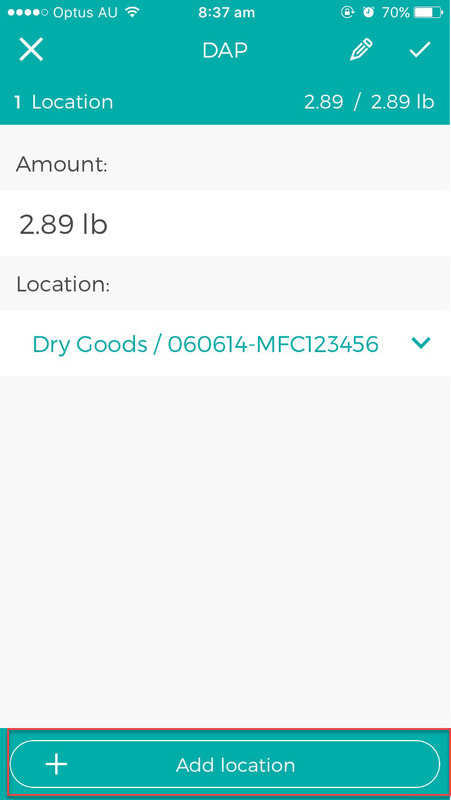 The above information will be shown in the app when the cellar hand views the work order. 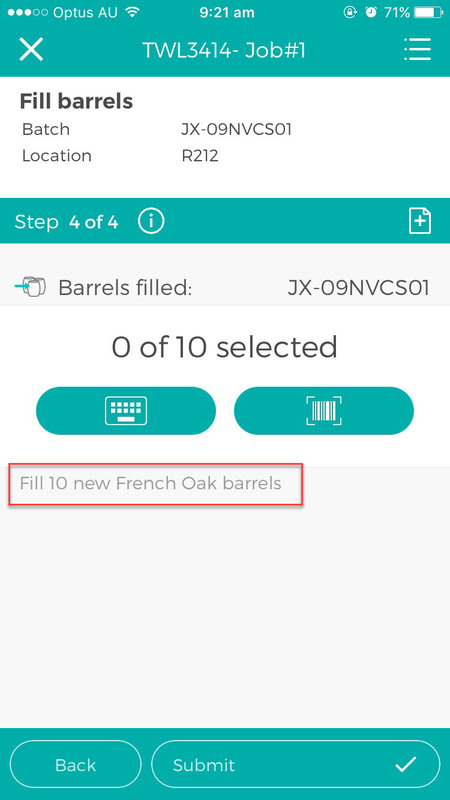 You can enter new barrels by scanning them in the app. 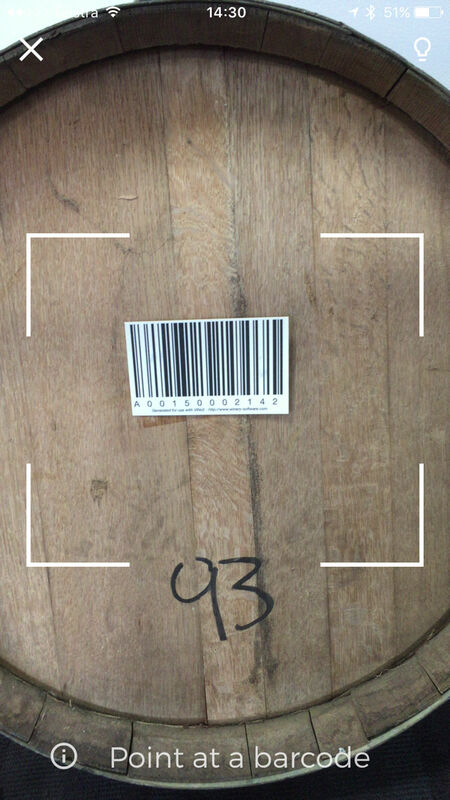 Tap on the the barcode icon and scan the barrels. 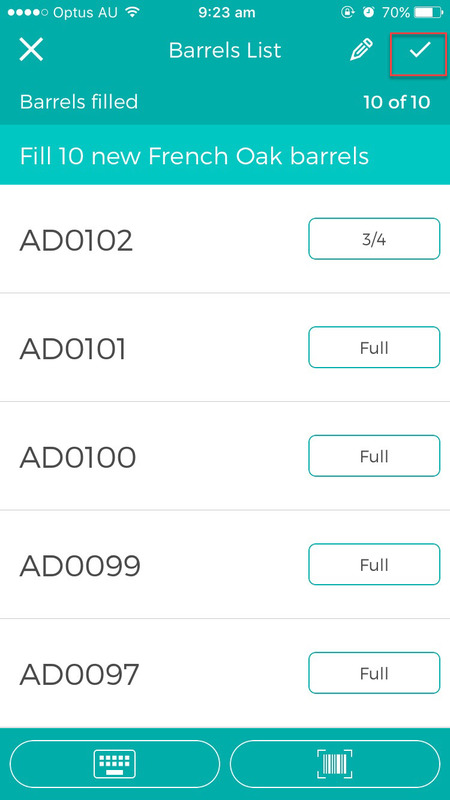 The scanned barrels will be added to the barrels list. You can also see an indicator of how many barrels have already been added on the upper right. 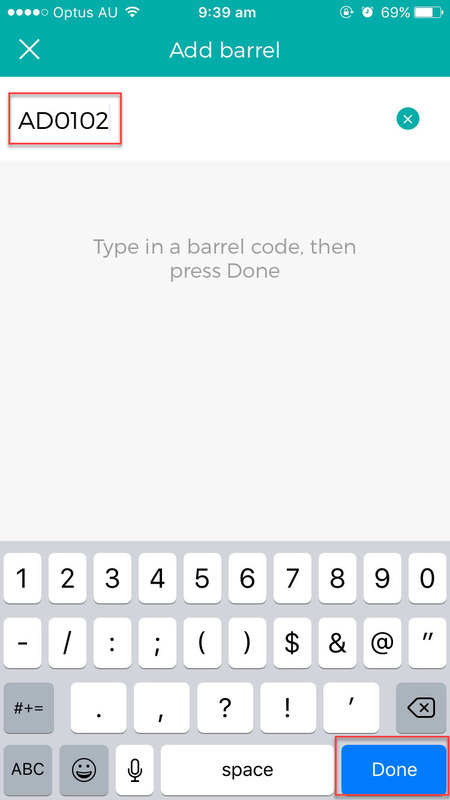 Alternatively, you can add barrels by typing the barrel code. Tap on the keyboard icon. 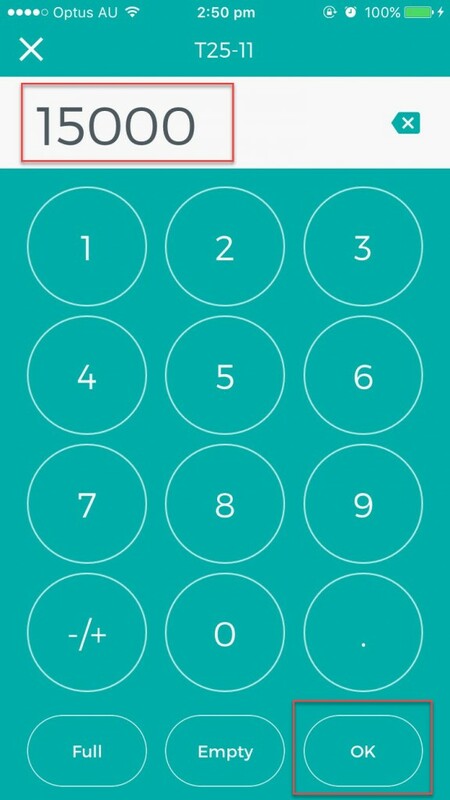 Enter the barrel code, tap on Done and this will be added to the list. 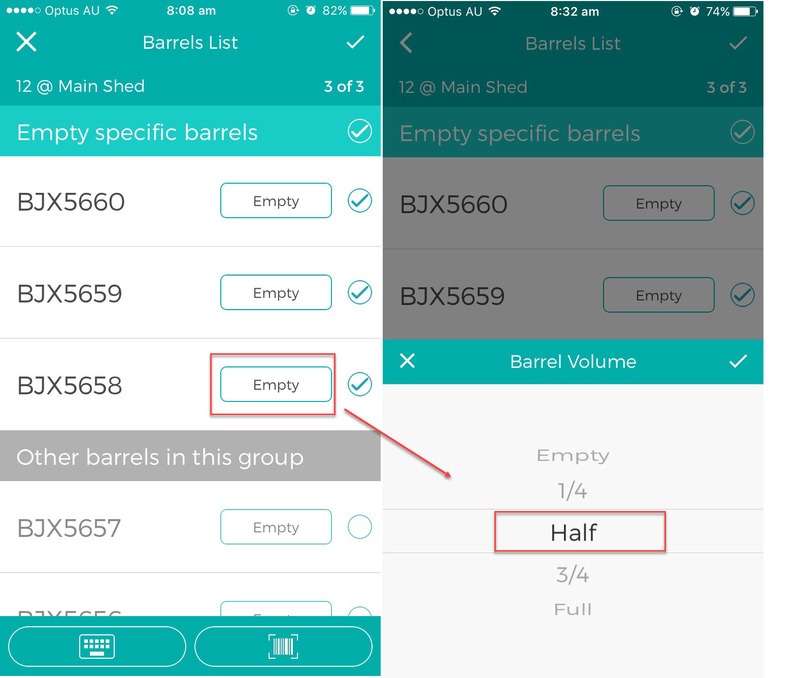 If you have incorrectly scanned a barrel and want to remove it from the group, tap on the pencil icon on the top of the barrels list. Tap on the barrel you want to remove and then tap on Delete button. 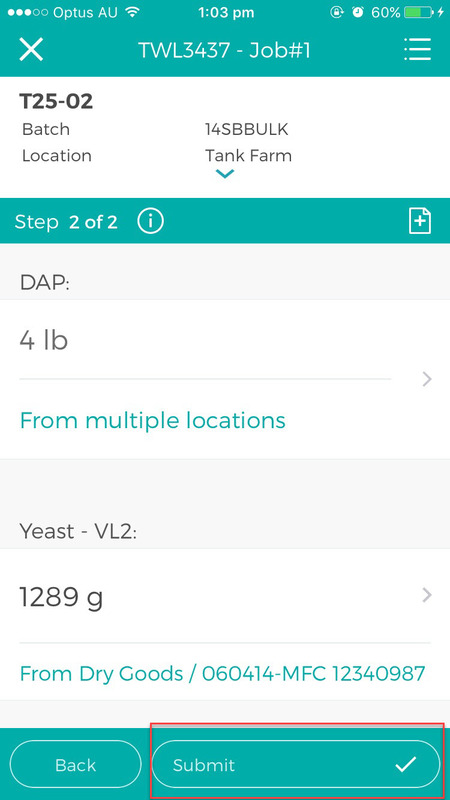 You can set the barrel’s volume to Full, 3/4, Half, or1/4 by tapping on the volume field. Once you have added all the required barrels, tap on the check icon on top to finish the step. 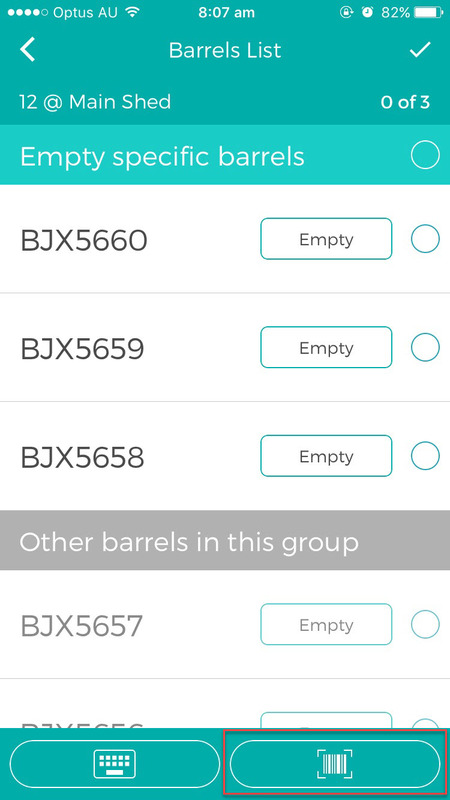 To confirm the barrels that have been filled, you can scan the barrel code by tapping on the barcode button. 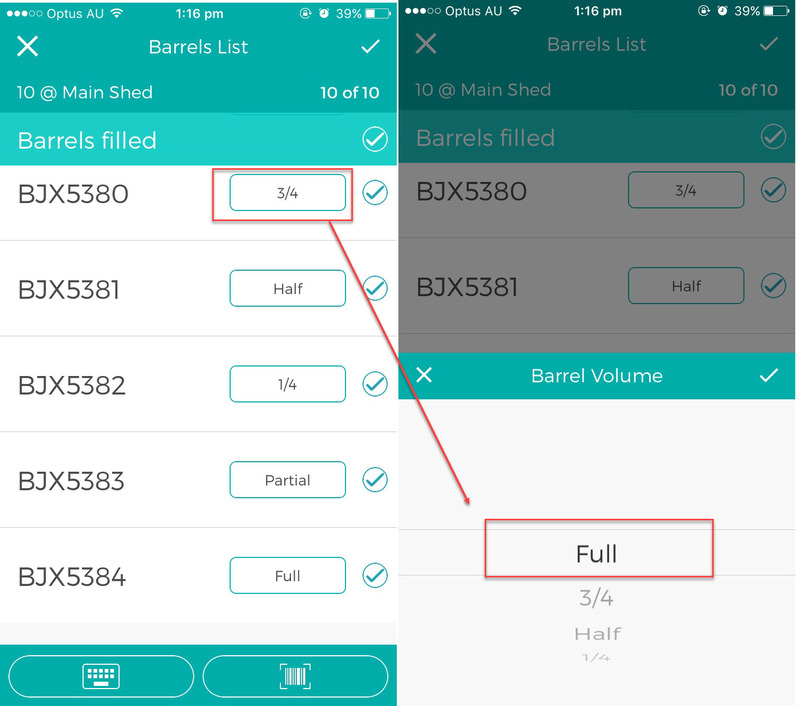 Alternatively, you can tap on the list icon to manually select the barrels. Each barrel will show the current volume in the barrel. 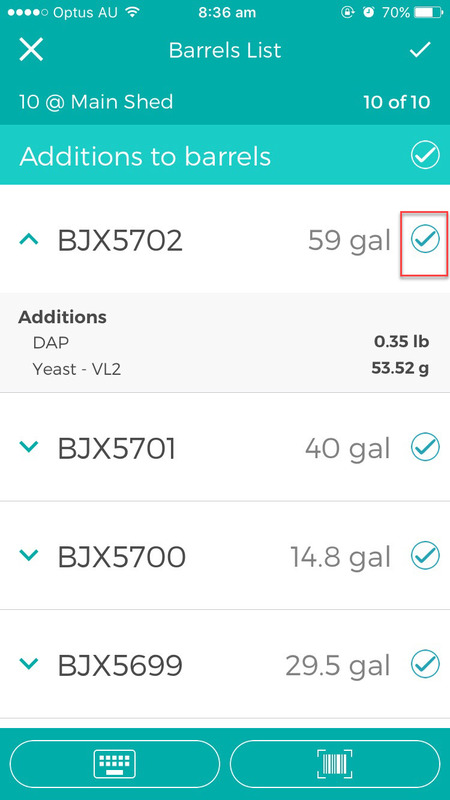 Tap the checkbox on the barrel you want to select. 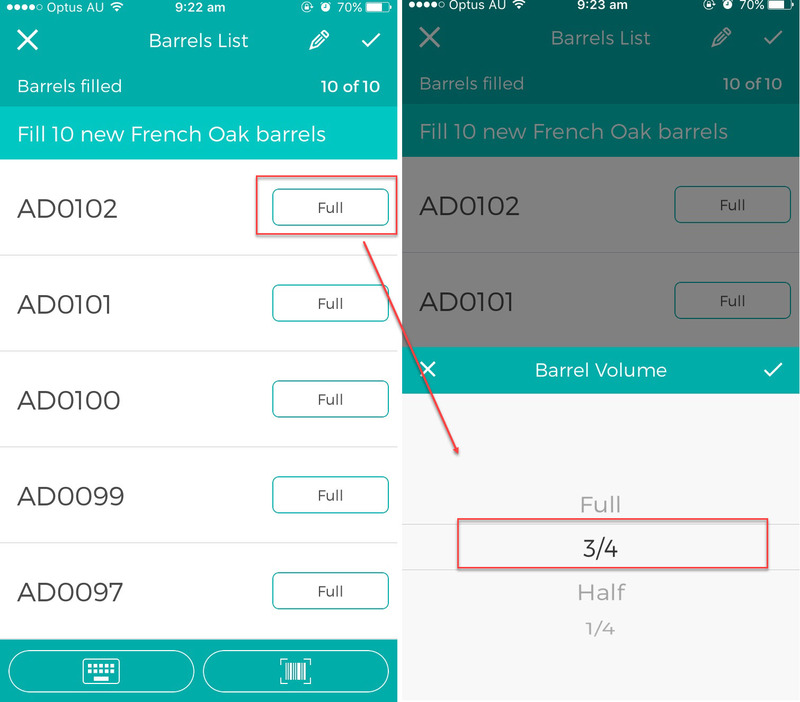 Change the barrel volume to by tapping on the volume field and selecting either Full, 3/4, Half, 1/4. The selection should be based the barrel’s new volume after the transfer. 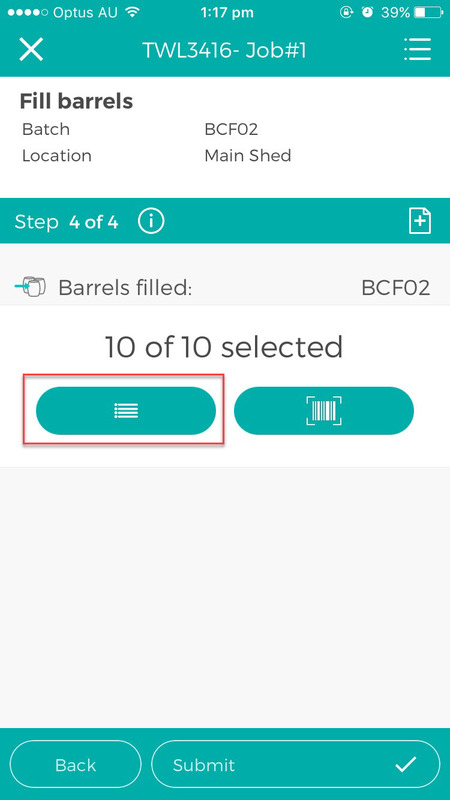 Once you have finished selecting all the barrels and changed the volumes accordingly, tap on the check icon on top to finish the step. 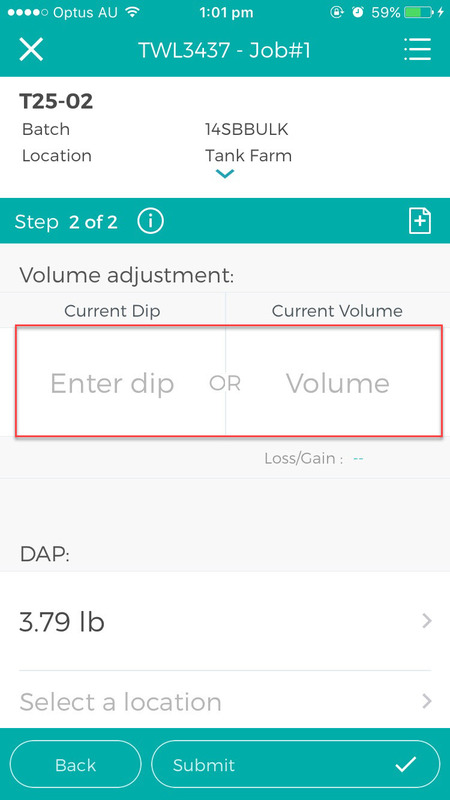 When making additions to tank from the app, you have the option to enter the tank dip or volume for any of the additions that increase tank volume. 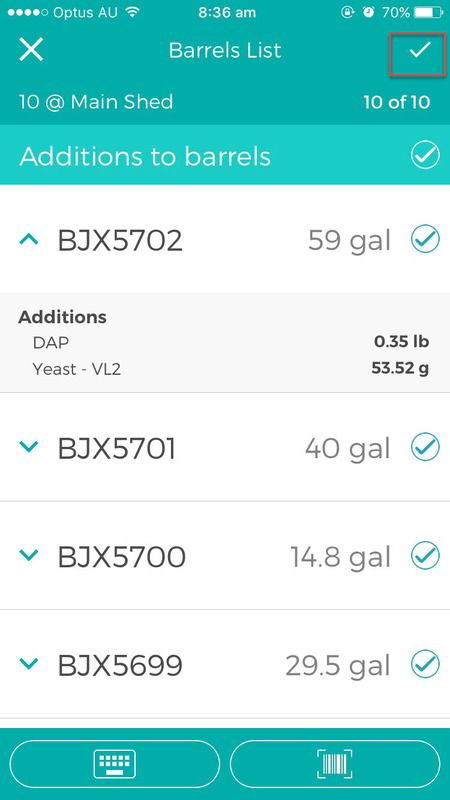 The additive amount that was entered during scheduling of the work order is pre-populated in the amount fields of the additives. 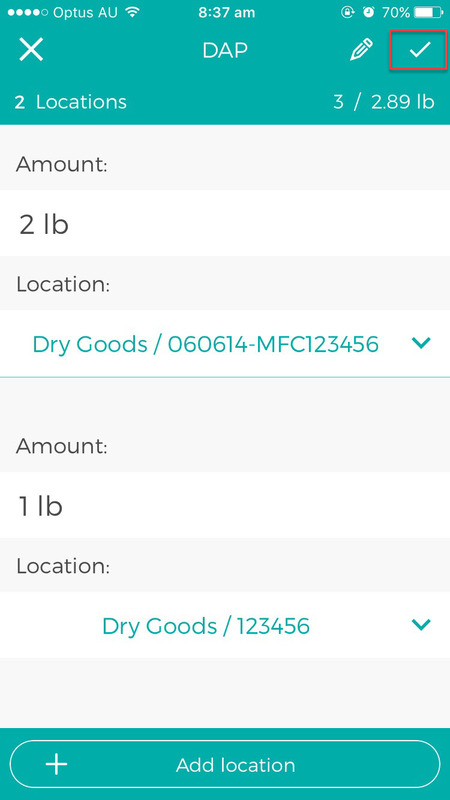 You can change the amount by tapping on the field. 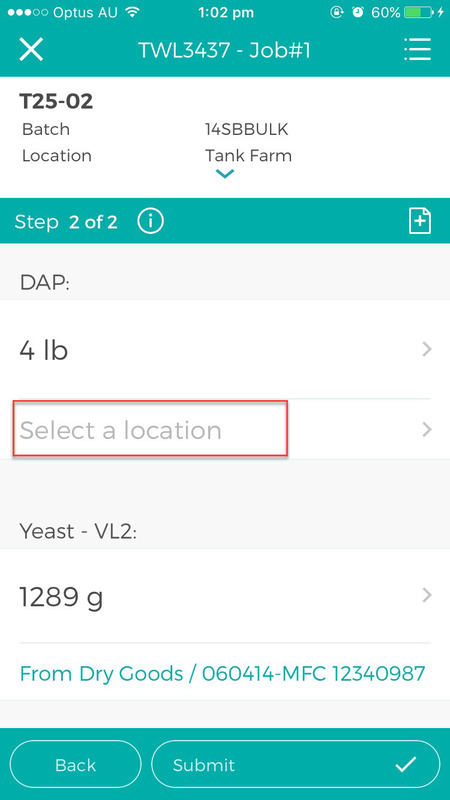 Enter the new value and tap on OK.
Next is to select the location where the additives where taken. Tap on the Select a location. 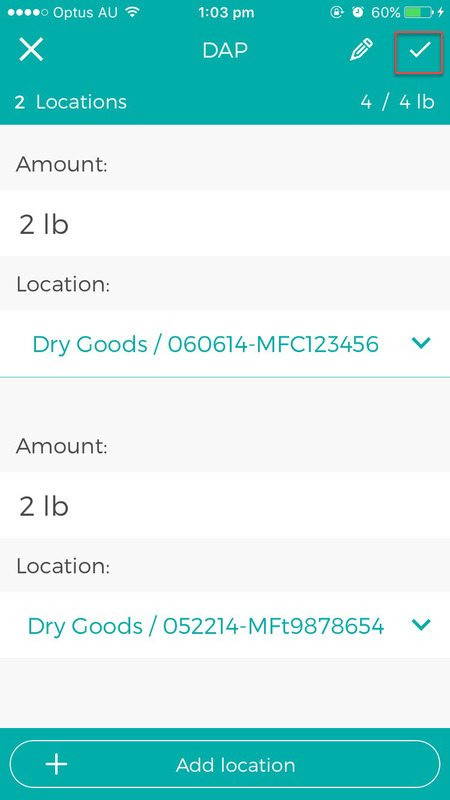 Scroll up or down to select the location then tap on the check icon to finish the selection. 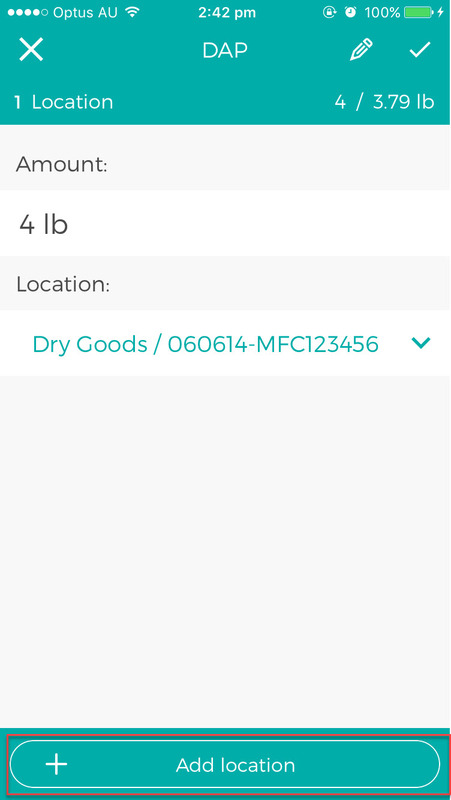 If you have sourced the additives from different locations, you can add a new location by tapping on Add location. 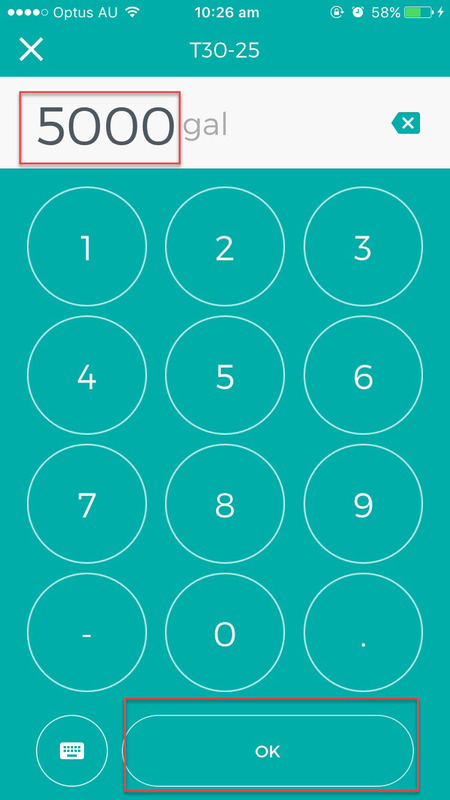 Enter the amount and select the location. 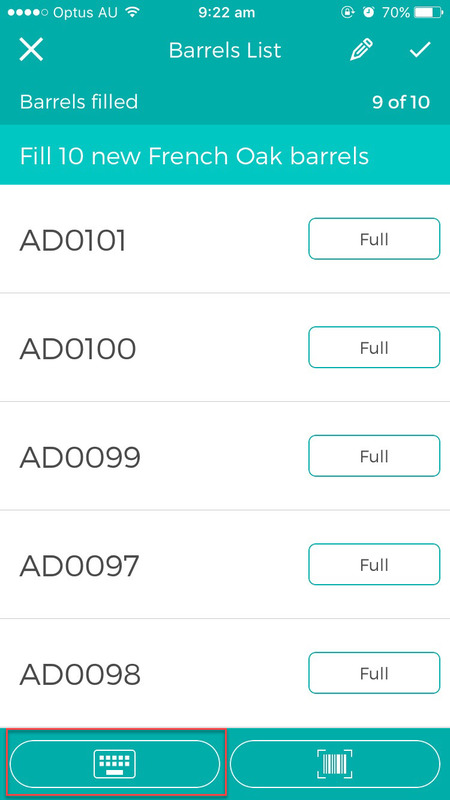 Then tap on the check icon on the upper right to complete the amount entry and location selection for the additive. 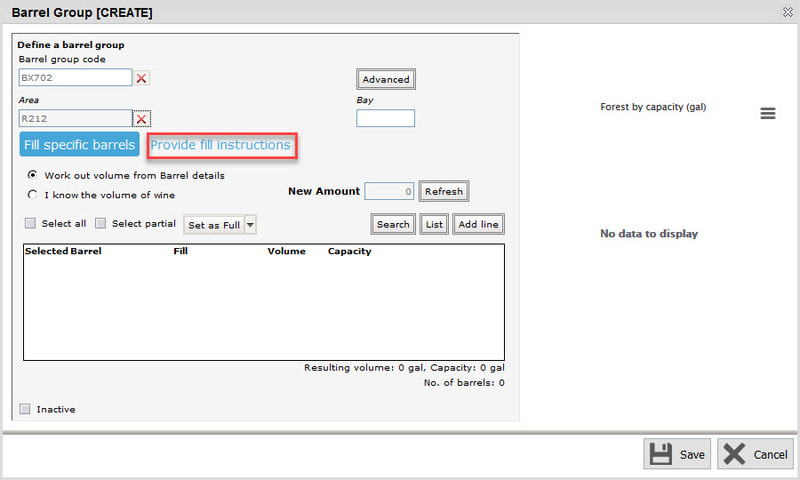 In the example below, we have sourced the 4 lb total amount of the additive from 2 different locations. 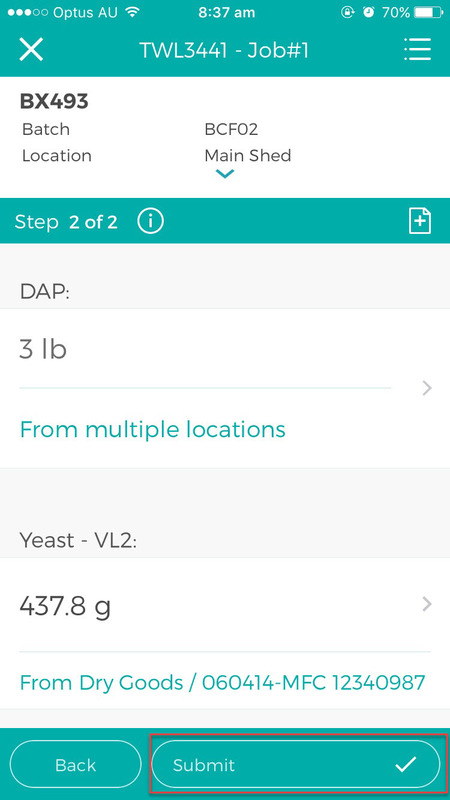 Tap on Submit button after you have confirmed all the additive amounts and locations for the addition step. 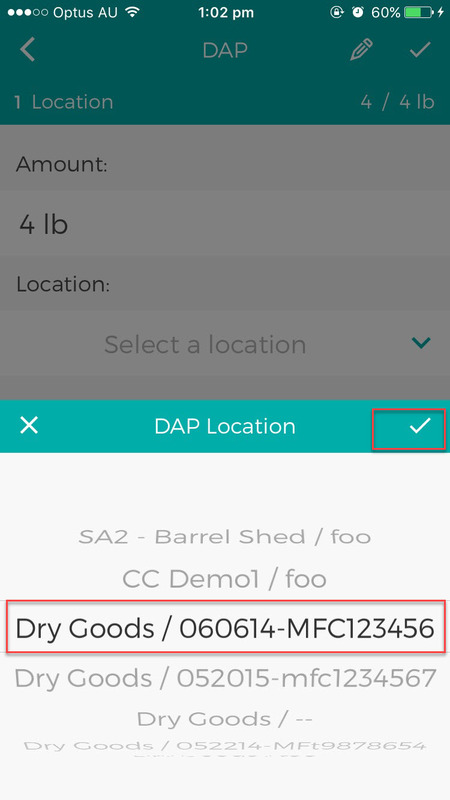 When making additions to barrels from the app, you need to select and confirm the barrels where the additions were made. 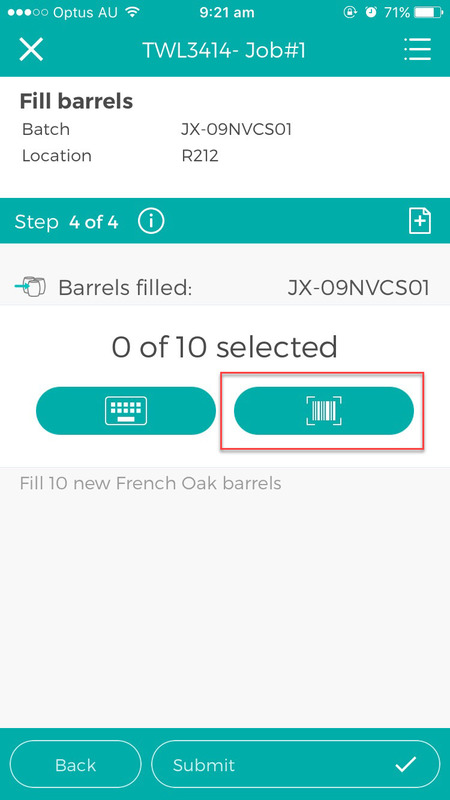 You can do this by scanning the barcodes of the barrels by tapping on the barcode icon then scan the barrels. 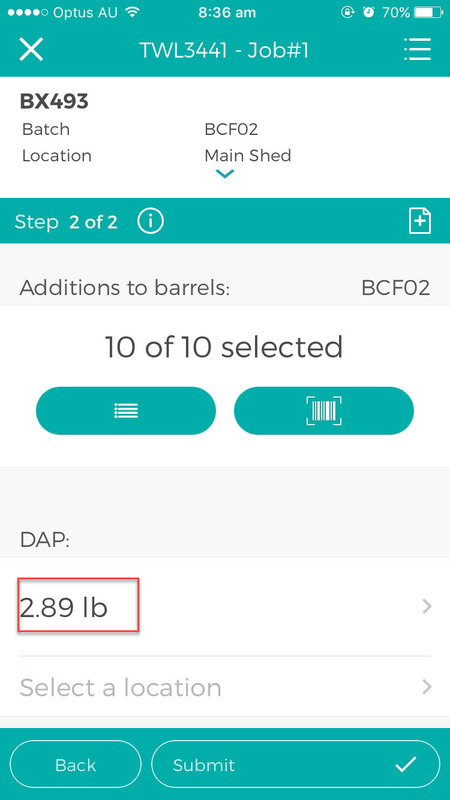 Once you have scanned the barrels, these will be checked in the list. Each barrel will show the current volume in the barrel. 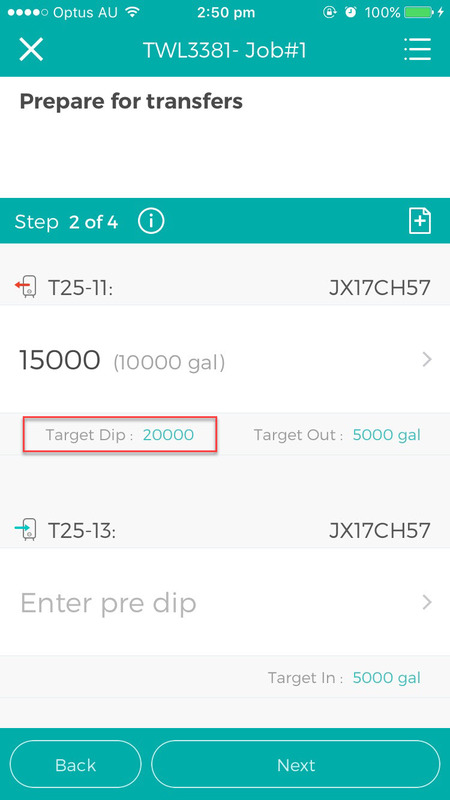 Tapping on ] the arrow icon on the barrel shows the addition amount required for that barrel. 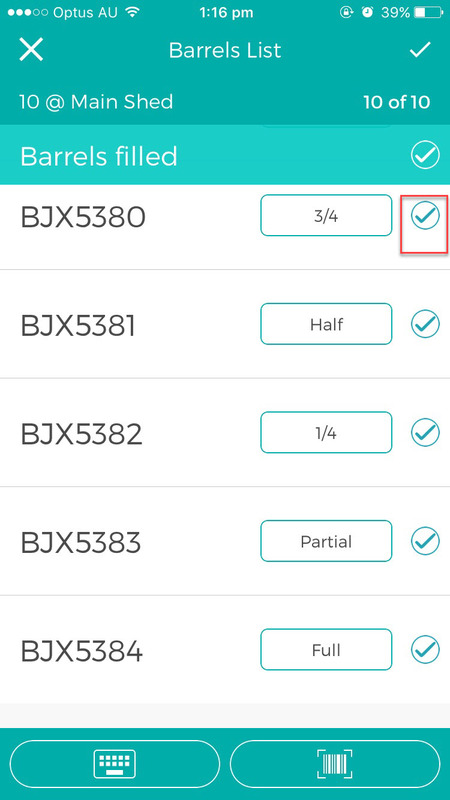 Tap the checkbox on the barrel you want to select. 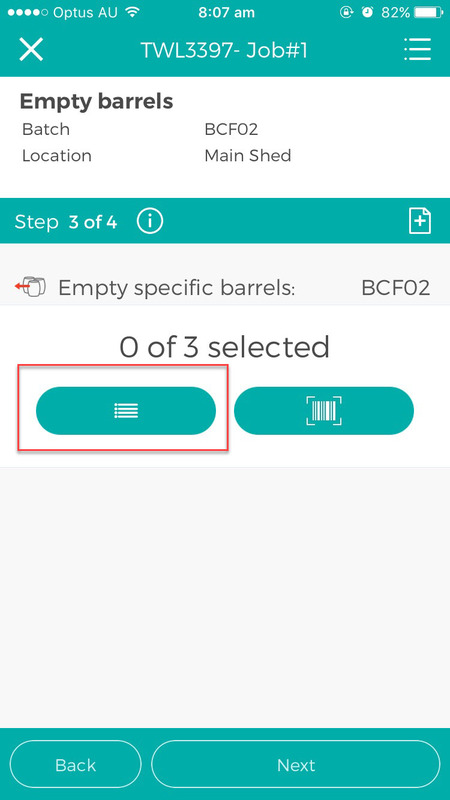 Once you have finished selecting barrels, tap on the check icon on the upper right to complete the barrel selection step.